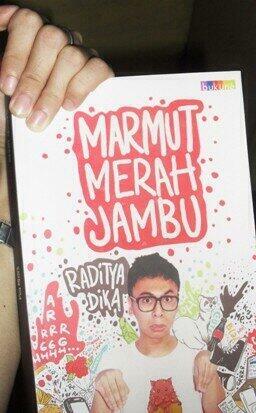 Raditya Dika Nasution is one of the comedian and also one of the famous writer in Indonesia. One of his works is “Marmut Merah Jambu.” This novel is a non-fiction comedy, and the contain is about the writer’s love story which told with comedy. how to understand love by introspection in the writer’s experience which is contained in this story. “Marmut Merah Jambu” consists of 13 parts, there are story of his love when he was in Junior High School, fall in love secretly, his one-side love, the unintentionally love, and when he loved by two strange twin girls. All of them are written with a comedy style. From those chapter, I will make a review one of the most interesting part, the title of this part is The Last Meeting with Ina Mangunkusumo (Pertemuan Terakhir dengan Ina Mangunkusumo). This story is begin when Dika told about his meeting with a woman whom he loved in Senior High School, her name is Ina. In the previous time, he was success to make a date with Ina. This moment was happen continously, but it didn’t make any something that meaningful for Ina. Until at the end of their study, they should to be apart because Ina should to continue her study in Adelaide. But after some years, they were meet again. Ina has worked in an Event Organizer company, and Dika has been a writer. When she met with Dika, she told about Anto, a man that she always told when they were in Junior High School. Obviously, Ina still had a feeling to Anto. Until someday, Anto said to Ina that he had had a girlfriend. Since that day, Ina understood that she was in the one-side love. Actually Dika want to told Ina that he was writing a new book, Marmut Merah Jambu that there will also contain of the story about his feeling to Ina, but Dika confused, he didn’t know how to told it. After in a moment, Dika got a bravery and finally he told it to Ina. “..... One of this chapter will tell the story about a woman that I never get her love,” said Dika. “what? With you? Emmm nononono! Of course not you. It so impossible to loving you, you know.... hahaha,” said Dika. “I think people who said that we are perfect if we meet with our soulmate is so a bad thought,” Ina said. “What do you mean?” Dika confused. Ina stared to him and she tried to explain what she told, “I mean that why we practically complite if there is a soulmate in our life? Why not because of a thing or a hobby that can say we are complite? why should be connected with others? Why our perfect life admitted that we’ve been able to meet with our soulmate? Unrequited love is one of the reason that makes we cry. If we have this situation, of course we will consider that we are inappropriate to deserve him. It likes to be reminded that we are not perfect. This story has an ending by giving us a pondering moment about the existence of someone who can not we forget completely. Seen from the physical, this book is thicker and more appreciable. It also has an interesting cover with a bright pink color, therfore it so suitable with the title “Marmut Merah Jambu.” The paper that used also has a good quality. Of course there is always any strengths and weaknesses in every books. No except for this book. After I read Marmut Merah Jambu, I found any weaknesses such as there is an incomplete paragraph that makes the readers slightly confused due to this missing scene. There is also some improper words if this novel read by the children. Although there is some weaknesses, I think this book is still interesting. Almost the entire of this novel is good enough, because the author use a colloquial language. So this book has already suitable for young people as a target readers. The plot also clear enough, therefore this story is easy to understand. Besides that, the story of this novel is based on the writer’s life experience, so I think it is an interesting book. In addition, this novel gives an enjoyment for the readers due to this is a comedy book. And actually I love to read this novel.